Surface Preparation - This is an important element of any painting project. Surface prep consists of 1. inspecting the property 2. identifying any evidence of chalking, peeling, or blistering of the surface paint, as well as noting any water damage. 3. Carrying out any repairs required. Pressure washing - A pressure wash eliminates algae, mildew, dirt, mold, and chalking that accumulates over the years and restores a clean surface to the house. For best results washing should be done atleast 7 days prior to painting the house. Scraping and Sanding – This is the preparation of the surface after a wash. This enables the surface to be free from any alien objects which may interfere with the priming. Priming – This is done to the house prior to the first coat. Priming is an important part of the painting process and all professional painters will perform this procedure before doing the first coat. Caulking - Caulking is applied water leaks, around windows, joints, among other places. House painters also proceed to mask any nooks and crannies that they wish to protect from paint. Here comes the fun part, Painting! To get the most effective job from your house painters it is recommended to do a bit of research prior to painting your house. Colours are very important, choosing the right hues and shades can a dramatic improvement on your house! Selecting one colour for accents on railings and doors, another color for trims and eaves, and a third colour for the walls. Contrasting the accent and trim colour in order to mask design defects and accentuate details of your house. Sometimes it is good to remember the KISS philosophy, Keep it Simple Stupid! Using fewer colours with good contrasts can leave an amazing result to the finish of your house. Ask your House Painters in Sydney to minimise extreme contrasts, unless you feel it is mandatory. Choose colours from the same colour family. Your House Painters should have a good selection. Balancing shades over the entire house. Compliment the exterior paint with the home's interior colours. Apply light colours to make the house appear larger and darker shades to make it seem smaller. Consulting historic colour charts (ask your house painters in Sydney) or applying a modern, bright colour to highlight architectural aspects when painting an older house. 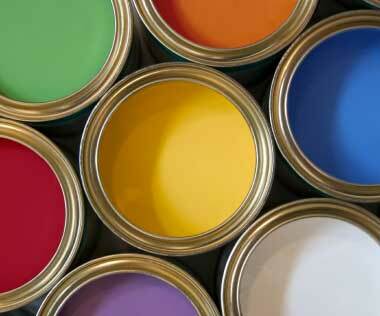 Consult online colour charts or get samples from your House Painters.